I have to say that no Wodehouse novel I've read previously ever went down as smoothly as Galahad at Blandings did. That's not to say it's the best Wodehouse novel I've read, because it isn't - it was just the easiest. As he always does, Wodehouse pleased me, but I have to say Galahad at Blandings lacked the charmingly civilized but also crucially anxious and frenetic energy of earlier Blandings stories (this being written quite late, in 1965, whereas most of the Blandings stories I've read previously were from the '20s or '30s). Even though we all know the endings of Wodehouse books will be happy, it seems to me the tension is key and my pleasure in reading Wodehouse this time around was somewhat subdued; in Galahad at Blandings, the happy ending was never seriously threatened. It was too easy. Also, the plot wasn't convoluted enough for me - I like my Wodehouse novels to get my synapses firing just a little. Ah well, not everything can be Leave it to Psmith or Uncle Fred in the Springtime. In any case, this book was a total success in one regard - it's helped get me one step closer to fulfilling my goal of reading 20 library books this year. 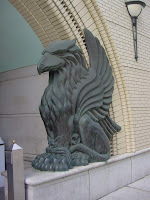 Living in the west, which I've always been told is best but never believed, my home library is now the d-gorgeous Lillian H. Smith branch, which besides having incredibly cool and rare collections of children's books and science fiction, also has GRYPHONS guarding the entrance. Rumour has it that said gryphons were snuck in by the architect at the last minute because he assumed they'd never be approved. Going to this library makes me incredibly happy because it's just such a beautiful physical space. But it also has a pretty good selection of fiction I'll likely be reading over the next year. And it has GRYPHONS. Yes it is the tension I love...always wondering how it will shake out in the end but knowing for sure it will. I plan on reading this some time this year, so thank you for the review. I am starting Uncle Fred in the Springtime today. Knowing you put it right up there with Leave it to Psmith, I know I won't be disappointed. Ooooh, I'm jealous that you're reading Uncle Fred in the Springtime - I hope you like it as much as I did.